Washington, NJ: Process equipment manufacturer The Witte Co., Washington, New Jersey (www.witte.com), customizes the height of its machinery with optional leg extensions. 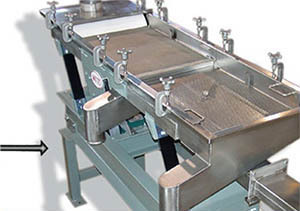 Available on the company’s entire line of vibrating fluid bed dryers and coolers, screeners, plastic pellet classifiers, vibratory conveyors and other process equipment, the customized height promotes ergonomic access to machine internals and product in process for constant viewing, easy cleaning and safe removal for testing. In addition, the sturdy, painted steel leg extensions effectively raise machine inlets, intakes and infeeds to seamlessly accommodate the position of upstream process equipment and ensure smooth, uninterrupted material flow while often eliminating the need for connecting conveyors, ramps and/or ductwork. Ideal for use in food, chemical, pharmaceutical, mineral, plastics, water/wastewater and other processing lines, the Witte leg extensions are custom designed to suit each individual installation and are manufactured at the company’s New Jersey facility. The leg extensions may be retrofit on process equipment in the field.